The Commons defence committee has highlighted seven main areas of concern in relation to what it calls the "challenges" facing UK troops in Iraq. It says the issues raise "a fundamental question about defence policy". These are relatively lightweight vehicles, many of which have previously been used in Northern Ireland. Good but old and prone to breaking down, the committee was told. They are fast and manoeuvrable and seen as important in allowing the soldiers to engage with local people - but vulnerable given the increased threat in the area, notably from roadside bombs. 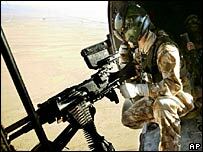 The Ministry of Defence (MoD) should consider an "off the shelf" purchase as an immediate and interim replacement, the MPs said. "It is unsatisfactory that the lack of capability was not addressed with greater urgency much earlier." Following a review Defence Secretary Des Browne did announce last month that the ministry would deploy 70 extra FV430 tracked troop carriers. These have better protection but are not thought as intimidating as the bigger Warriors. 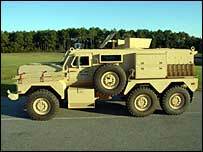 The MoD also ordered 100 US Cougars - massive wheeled patrol vehicles already used extensively by US troops in Iraq. Cougar manufacturer Force Protection Inc. draws attention to the way it makes the ubiquitous Humvee look tiny, marketing it with the slogan "Drop your purse, it's not a Hummer". But it will take months to procure and upgrade the new vehicles. The recent heatwave in the UK had people unaccustomed to a hot climate wilting in temperatures in the low 30s Celsius - which is similar to the current daytime average in Basra in southern Iraq, where the UK forces are concentrated. 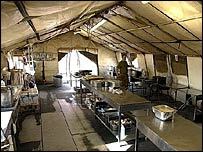 The MPs reported: "We witnessed at first hand the extreme temperatures our troops are subjected to in the back of the Warrior, which, we were told, exceeded 60 degrees Celsius. 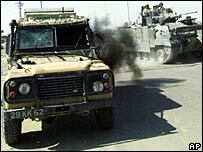 "Some medical staff expressed the view that there could be fatalities as a result of these temperatures unless Warrior and other armoured vehicles were fitted with air conditioning or some other cooling system." They considered personal coolant packs to be unrealistic, especially with the amount of kit soldiers already have to carry. They called for an urgent investigation into equipping vehicles and buildings with air conditioning and said it was unacceptable the issue had not already been addressed in the three years the troops had been in Iraq. The committee was impressed by the various "critical" roles being performed by the joint services' helicopter force. The trouble was, they said, there were not enough aircraft - which meant units having to do multiple tours of duty. The MoD should take urgent steps to remedy the shortage, it said. The Ministry of Defence was incapable of operating a reliable air service between Iraq and the UK, the committee said. As a result, service men and women who were already having to work longer tours than necessary had their leave disrupted, which the MPs regarded as "unacceptable". On 30 January 2005 an RAF C-130 Hercules transport aircraft was shot down as it left Baghdad, killing all 10 on board. Shots from the ground caused an explosion in a right wing fuel tank, tearing off part of the wing. In response the MoD decided to fit an explosion suppressant foam safety system to fuel tanks of aircraft deemed most at risk. The defence select committee said it believed this should be fitted not just to some Hercules but to all of them in operational areas. "The protection of our armed forces should be given the highest priority." A large study comparing the foam system with a different, inert gas system, is due to be published at the end of 2006. The MPs say they hope the lessons learned will be incorporated into the A400M aircraft which will replace the Hercules from 2011. The committee heard complaints from service personnel about the lack of financial recognition for the effort they were putting in. "Comparisons of terms and conditions of service within a coalition can easily lead to perceptions of being treated less favourably, and this can be damaging to morale," it said. Noting that it was "not unreasonable" to expect some reward for active service overseas, the MPs said they would pursue the issue further. The MPs are blunt: "The MoD's confidence that the UK armed forces are not overstretched contrasts with what we are hearing from service personnel on the ground." Their fear is that the military's "can-do" attitude might damage operational capability. It is, they note, "a matter of crucial importance". There is also a reliance on reservists which "may not be sustainable". In response, Defence Secretary Des Browne reiterated the view of the top brass that the UK's forces were "stretched, but not overstretched". He said that since the MPs' visit to Iraq, Muthanna - one of the four provinces in the south east - had been handed over to local control, reducing the UK forces' commitment. But Iraq is not the only issue, as the recent flurry of concern over resources in Afghanistan also demonstrated. And the committee sees the problem as being wider. "Over recent years, the MoD has been quick to implement changes that produce savings but it does not appear to have addressed the growing number of capability gaps with the same or sufficient urgency," its report said. "Long-term procurement projects are failing to deliver mission-critical capabilities on time." And the solution "may well require more money - not just a reshuffling of priorities." They conclude that the issues raise a fundamental question about defence policy: are the armed forces structured, trained and equipped to fulfil the role envisaged for them?